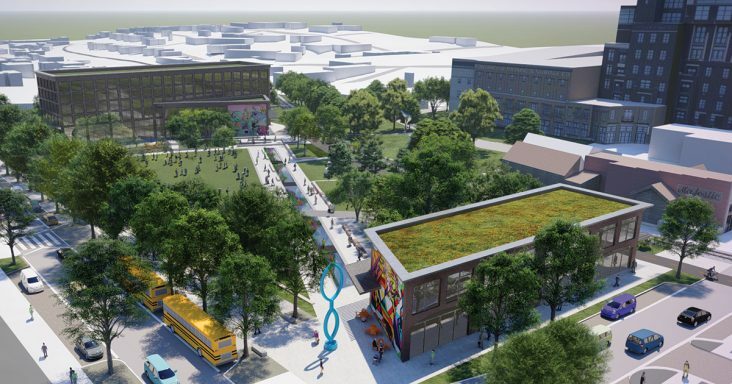 The Civic Plaza at Dickson Street and West Avenue is part of a nearly $32 million project to develop 12 acres within the Cultural Arts Corridor in downtown Fayetteville. 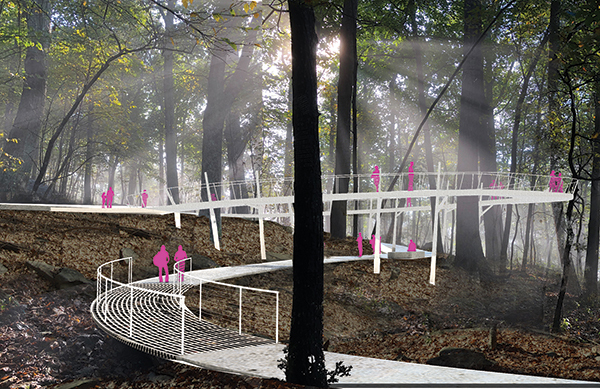 Nelson Byrd Woltz Landscape Architects of Charlottesville, Va., was selected in March to design the corridor project. The Northwest Arkansas Design Excellence Program of the Walton Family Foundation has provided grants to design park and civic space projects in four downtowns in Northwest Arkansas, and the projects are in various design stages, including a nearly $32 million project in downtown Fayetteville. The cities of Bentonville, Fayetteville and Rogers and nonprofit Downtown Springdale Alliance received $3.6 million in 2017 as program grantees, and so far, three of the grantees have project designers. They were selected from a pool of about 50 architects, which are chosen by a committee of designers. The foundation will seek proposals to add more architects in the first quarter of 2019, and it will also offer new project proposals this year, said Jeremy Pate, program officer for the Home Region Program of the Walton Family Foundation. Nelson Byrd Woltz Landscape Architects of Charlottesville, Va., was selected in March to design the 12-acre Cultural Arts Corridor, south of Dickson Street in Fayetteville. Walton Family Foundation gave $1.77 million for the design. The $31.68 million project will include a 2.5-acre Civic Plaza, 9.5-acre Fay Jones Woods and replacement parking, which is expected to cost $10 million. The parking will be for the 290-space West Avenue lot that will be developed into the Civic Plaza at the southwest corner of Dickson Street and West Avenue. Engineering firm Garver is studying five locations for replacement parking within 1,000 feet of the West Avenue entrance at the Walton Arts Center, and the city expects to have the firm’s recommendation by the end of February or early March, said Peter Nierengarten, sustainability director for the city of Fayetteville. When asked about the effect of ridesharing companies, such as Uber and Lyft, on the need to replace parking, Nierengarten explained the potential for ridesharing and valet companies to offset the impact of the relocated parking. 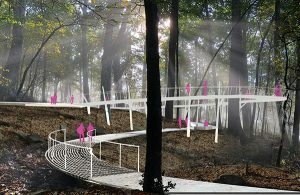 A Canopy Walk Loop was included in the design for the trail through the 9.5-acre Fay Jones Woods within the Cultural Arts Corridor in downtown Fayetteville. Work on the plaza is expected to start in spring 2021 and be completed in summer 2022, said Nierengarten, adding that work on the plaza won’t start until the replacement parking is completed. Work on the parking and Fay Jones Woods should start in spring 2020 and be completed in spring 2021. Over the summer, the city selected Nabholz as the contractor. The project is expected to be paid for with money from a $226.06 million bond issue. Voters will decide on April 9 whether to extend a 1-cent sales tax to issue the bonds. Walton Family Foundation gave $642,638 to Downtown Springdale Alliance to complete design work for Luther George Park in downtown Springdale. Wes Michaels, principal of landscape architect firm Spackman Mossop Michaels of New Orleans, said work on the project started in November, and the firm recently hosted a series of public meetings to receive resident feedback on what they’d like to see in the park. The next step includes completing an initial design, and he expects it to be presented in the third week of February. The design will come from the ideas the architect gathered from the community meetings, and the community will have more opportunities to provide feedback in February, Michaels said. He said the community is excited about investing into their downtown, and some of the reoccurring themes from the feedback included a park that includes everyone, art, music, events, nature and play and connections to the 36-mile Razorback Regional Greenway, downtown and neighborhoods. When asked what makes this project unique, Michaels said the 14-acre Luther George Park is the largest urban park in Northwest Arkansas. Spackman Mossop Michaels is the lead architect on the project. And including the other firms involved in the design work, about 12 people are working on it. He expects the final design to be completed by July. A construction timeline has not been set, and the project will likely be completed in phases or be paid for with a combination of public and private money, said Ashley Earhart, director of public relations for the city of Springdale. Walton Family Foundation provided $453,000 to redesign the 1-acre Dave Peel Park in downtown Bentonville and to design a project to connect five parks into a cohesive experience, connecting a total of 3.8 acres in a Quilt of Parks. The project is expected to include signs and elements to show all the properties are parks managed by the city of Bentonville, said David Wright, director of the city parks department. Wright recently received proposals from five architects for the project, including Copenhagen-based Gehl; Reed Hilderbrand Landscape Architecture of Cambridge, Mass. ; Philadelphia-based Andropogon Associates; Stoss Landscape Urbanism of Boston; and Design Workshop Inc. of Aspen, Colo. He hopes to have the firms narrowed down to three and start to interview them by mid-March. He said he’d like to have one under contract by May 1 and to see the design completed by the end of the year. The process will include public participation and involvement from organizations such as Downtown Bentonville Inc. and Visit Bentonville, he said. A construction budget has yet to be set, and construction could take between five and seven years to complete depending on when funding becomes available, he said. He believes the first project would be work on Dave Peel. Design has been completed for the redevelopment of Frisco Park in downtown Rogers, and the city planning commission accepted the final design on Jan. 15. Ross Barney Architects of Chicago completed the design for the 4-acre park that will be renamed to Railyard Park. The Arkansas & Missouri Railroad runs through the middle of the park, and it will include a covered area for events, a stage, farmers market, water features, play areas and orchards. A contractor has yet to be selected for its construction, and a timeline for completion has not been determined, said Ben Cline, public relations specialist for the city of Rogers. Construction is expected to cost $6 million and will be paid for with money from the 2018 bond issue. With more than 70% of the vote, voters in August approved a 1-cent sales tax extension allowing the city to issue $240 million in bonds and pay off nearly $60 million in existing bonds. Nearly 75%, or $178 million, of the bond issue will go to street improvements, and $41 million will go to city parks, including the Railyard Park project. Walton Family Foundation gave $805,668 for its design. Construction is expected to start no later than Dec. 1, Cline said. Talk Business & Politics is a news website that covers business, politics and culture in Arkansas. You can also sign up for daily e-mail news delivered every morning to your inbox.